High-tech sealant and adhesive that offers outstanding adhesion to all sanitary, bathroom, wetroom, kitchen and plumbing materials. Can be applied to wet surfaces, will even work underwater, and contains Steritouch anti-bacterial solution, preventing black mould and discolouration for 10 years. 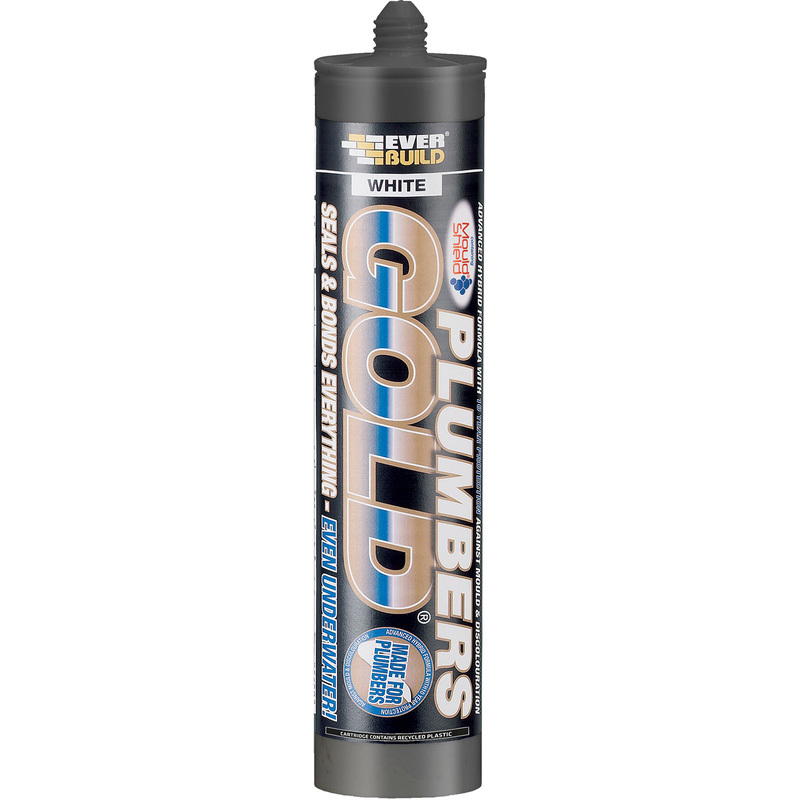 Plumbers Gold Sealant & Adhesive 290ml White is rated 4.8 out of 5 by 64. Rated 5 out of 5 by RC Herts from Excellent silicone and adhesive I use plumbers gold for a variety of jobs: 1) bedding in basin wastes into sinks instead of using a washer. The basin waste is held in position with no leaks and the antibacterial properties of plumbers gold also prevent mold from forming; 2) as an adhesive for worktops on top of bathroom units and for adhering wood to tiles. It forms a strong bond which can be broken by cutting into the set plumbers gold if needed. Rated 5 out of 5 by Teejay115 from Just the job Saw this advertised on you tube as the best product for use when replacing a basin waste. Thought I'd give it a go and certainly glad I did. Excellent product, easy to use and fitted the waste without a hitch. Rated 5 out of 5 by Dogchops 100 from Best on market This stuff is phenomenal. Use it for fantastic bonding and setting in wastes etc.YOU WILL GET NO LEAKS! Rated 5 out of 5 by Pennyamyam from Top product. Does a better job than silicone. The bedt I have used. Worth the extra cost. Rated 5 out of 5 by Mike12 from Very good product. Much superior to silicone in many applications. Rated 5 out of 5 by Daleboy from Great product You get's what you pay for and although this is somewhat more expensive than other products it's far far superior.